A HUGE thanks you to BEHR PAINT for sponsoring this project and this post! My favorable opinions of this amazing paint are all my own!! 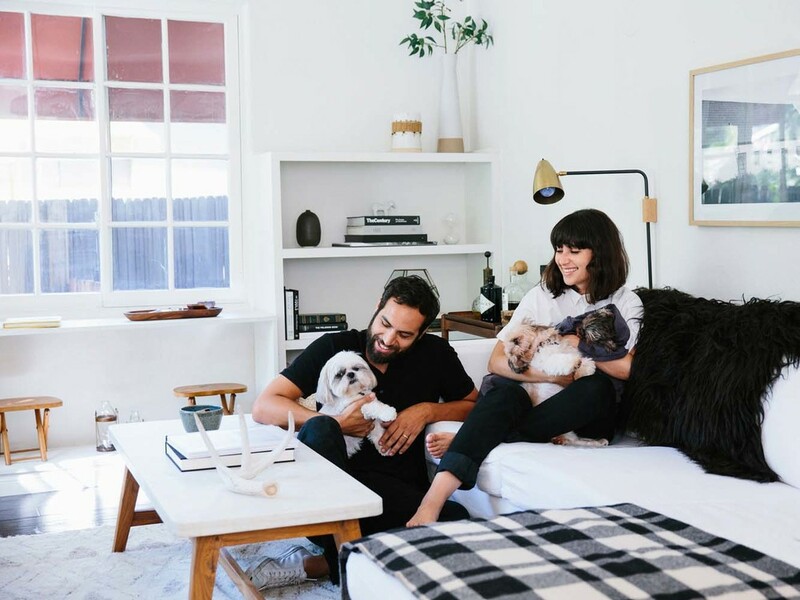 Buying a new house on a whim is one thing, deciding to move in and paint nearly every room in the first month is just plain crazy, or so I’ve been told. It’s ok, I love a challenge and patience is not my virtue so we dove right in and got started! Before we get down to the natty gritty, can I just say picking paint colours is HARD! Like who knew there were a gazillion shades of white? Thank god for Behr’s Colour Studio on their website (and you can also download the handy dandy app), it was truly a life saver for me!! I mean I brought paint chips to a prior walk thru of the new house and had narrowed a few choices down but I was totally undecided until I delved into Behr’s Colour Studio. My hubby isn’t much help in the paint department, he likes to leave these decisions to me and then he’s surprised when the paint cans are opened! 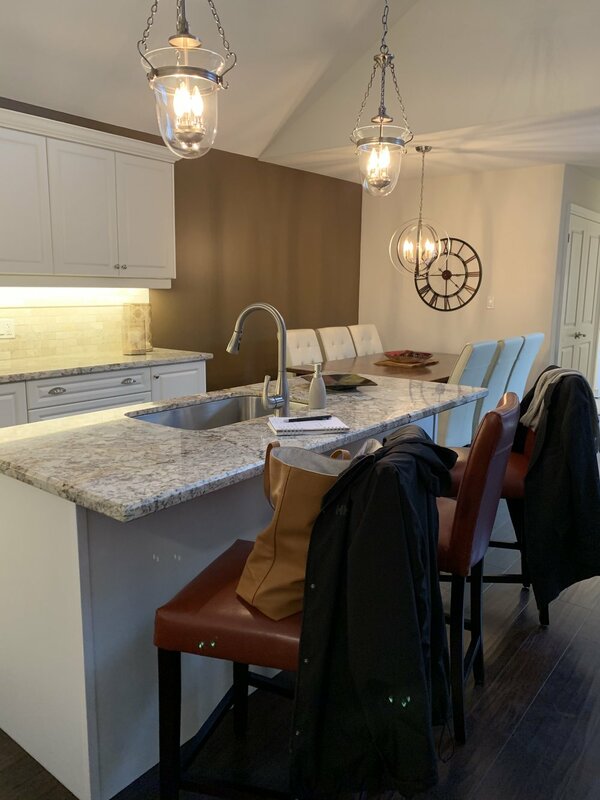 The first order of business in this cute little bungaloft that we now call home was the kitchen/dining/living room area, complete with vaulted ceilings. Go big or go home right? I will be honest, I am not a lover of white walls but moving into a house that is 75% open spaces with vaulted ceilings, I knew I had to get over it and embrace a little white-ness in the space (even though my true loves are bold, dark, moody colours - not including this horrible brown colour that was in this space when we bought the house). 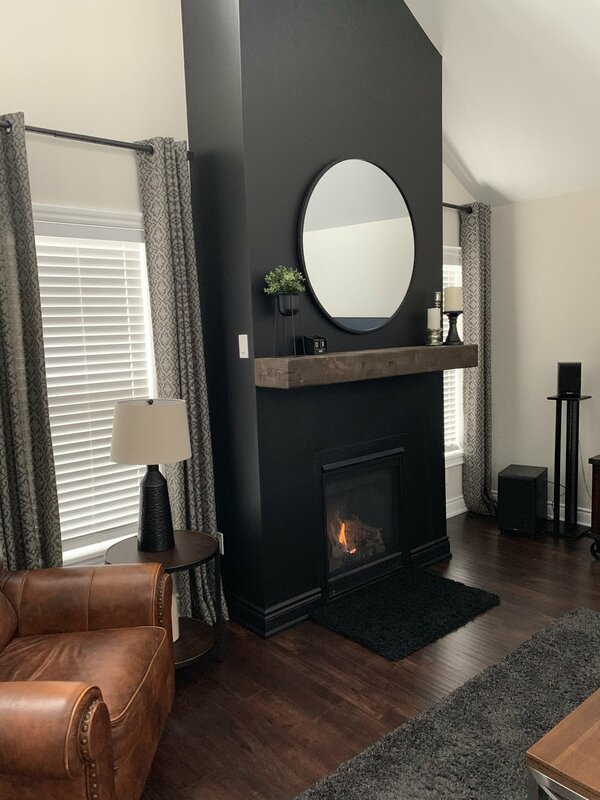 After much deliberation, pouring over paint chips and using the BEHR Colour Studio, I knew I couldn’t live with a pure white, I wanted something just a little bit warmer and finally settled on BEHR PREMIUM PLUS ULTRA® Off White PPU73 (tinted in BEHR MARQUEE®). 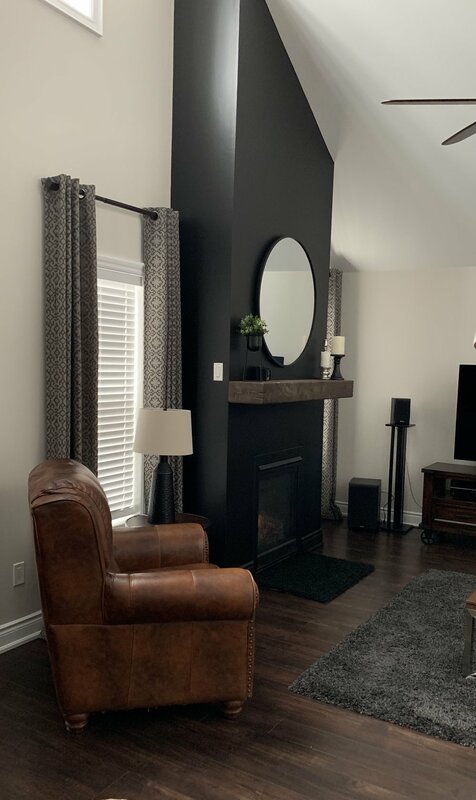 Another reason I did not want a bright white was because the accent colour I chose these spaces to replace that god awful brown was…drumroll please…BLACK! 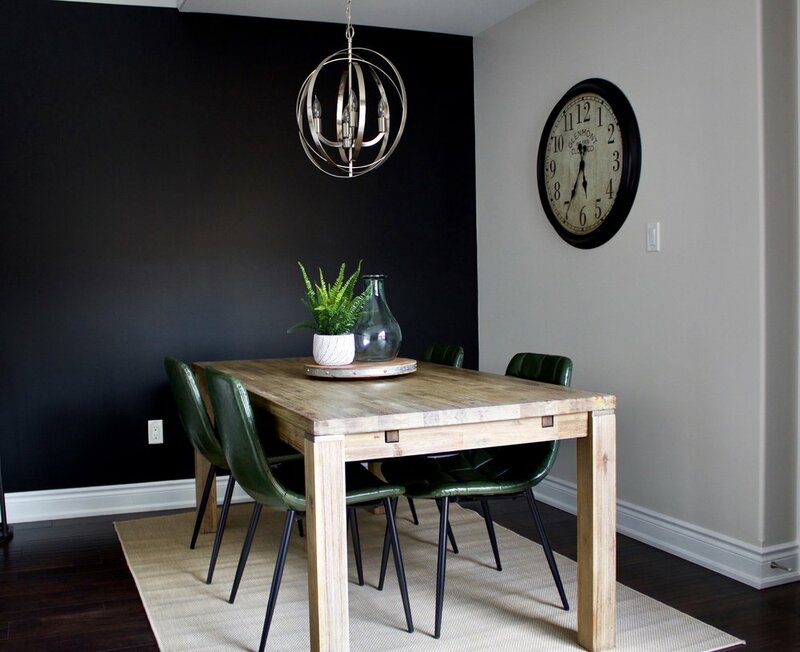 I have been dreaming about a black accent wall for months and when we bought this house I knew my dreams were finally going to come true! And while there aren’t as many shades of black as there are white, there are still A LOT. 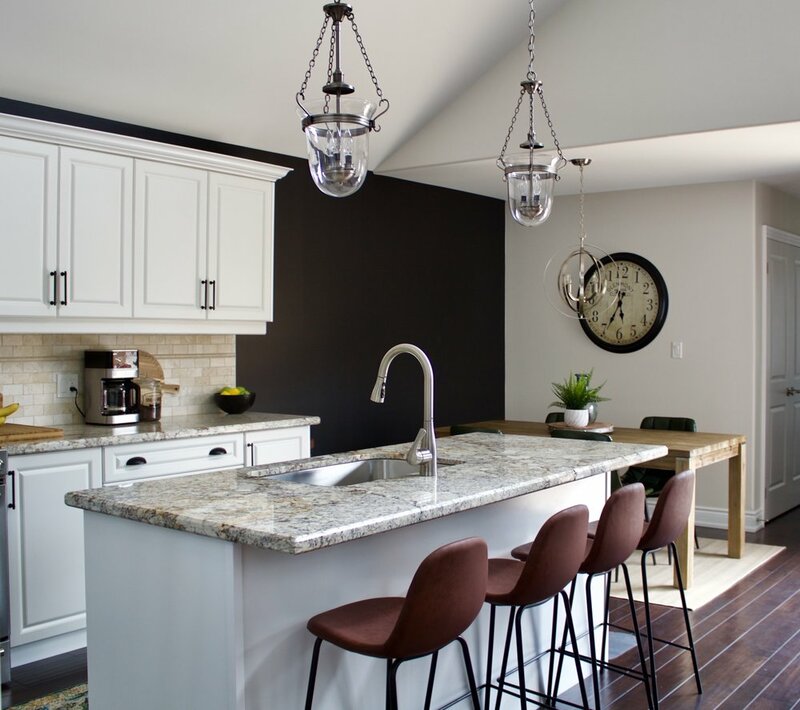 I took this little dilemma to the Behr Paint pros at my local Home Depot and with no hesitation they recommended BEHR MARQUEE® Limousine Leather MQ5-05 as the truest shade of black. The walls needed minimal prep work because the house is just shy of two years old. Other than the brown accents, the rest of the house is still builder grade primer. A couple of nail pops to repair, some light sanding and it was go time. When the first roll of Limousine Leather hit the wall it was LOVE at first site! And then when the fireplace got started, I was a goner! It turned into a painting/dance party at that moment! 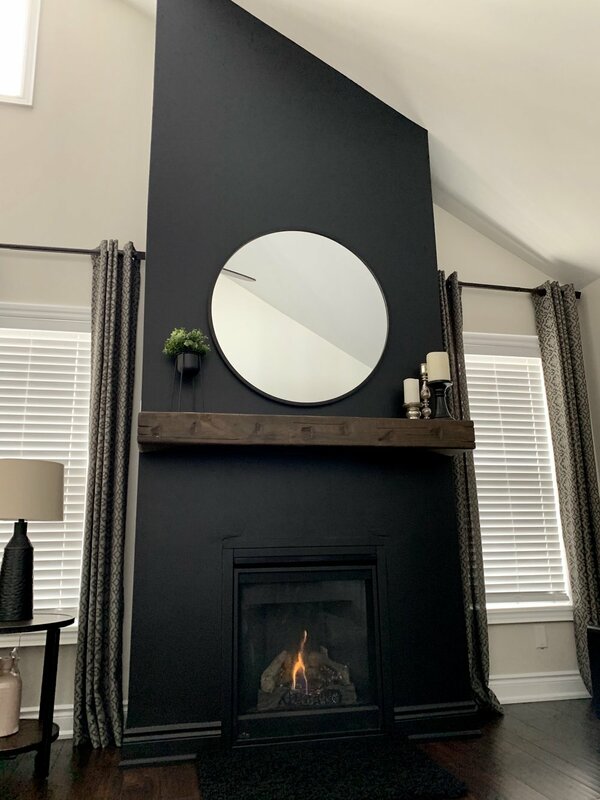 We only had one slight dilemma above the trim around the fireplace and quickly decided it needed to be painted the same beautiful shade of black as the rest of the fireplace. At this point we decided the trim around the fireplace needed to be painted Limousine Leather too! Any worries I had about painting the remaining walls a lighter colour vanished as soon as the first wall was painted out with “Off White”. 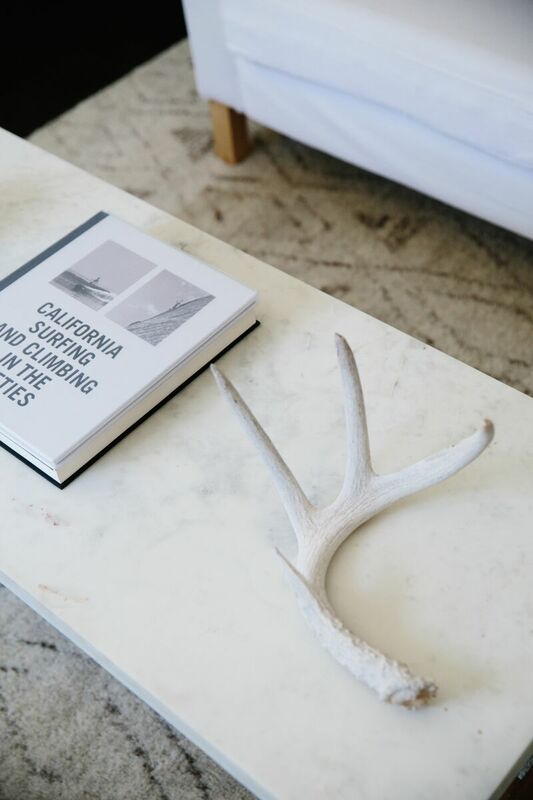 It is the perfect shade of coziness and pairs with the black beautifully. And you can see just how warm of a “white” it is next to the BEHR MARQUEE® Ultra White PPU18-06 we used on the trim. I honestly can’t say enough about the quality of the BEHR MARQUEE® line. It literally goes on like butter. Aside from the areas that were cut in with a brush, we could have gotten away with a single coat of the Limousine Leather, the coverage was phenomenal. The remaining walls needed two coats of Off White, only because, as I said, this is a newer house and the walls still had the builder grade primer. Two coats covered perfectly. We used an “Eggshell” finish on the walls which is totally durable and scrubbable (important when you have teenagers and pets!) and a semi-gloss finish on the trim. We haven’t quite got all of our finishing touches in place yet, there are pictures to be hung and new furniture to be delivered, but one thing is for certain, the house is already feeling like our own cozy home less than two week after we got the keys, all thanks to a few gallons of paint! 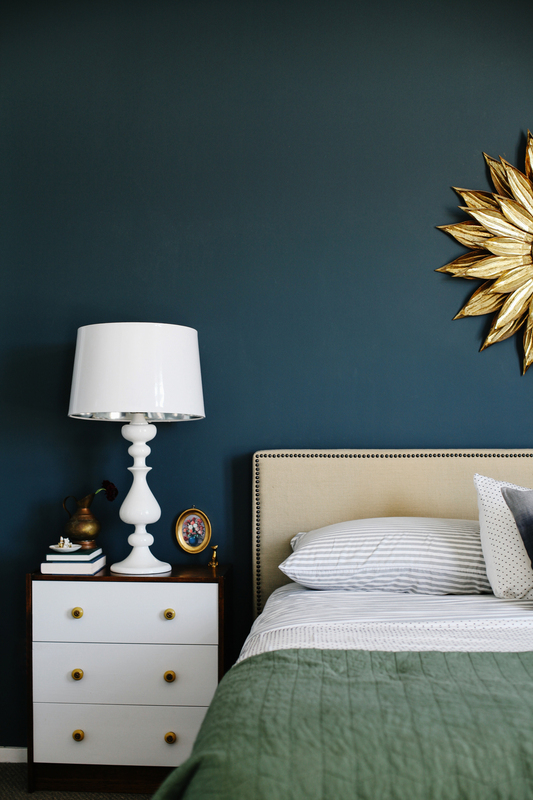 Keep following along, next week we will be sharing how we transform our master bedroom with Behr Paint! !